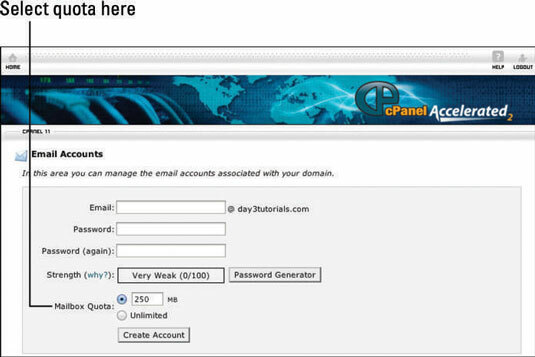 Your web hosting control panel is where you create e-mail addresses. You can have multiple addresses, depending on the limits set by your web host, so you can have one for yourself and give one to each of your employees, associates, family members, or whomever you want to give them to. Log in to your control panel and find the section labeled Mail or Email. The section is labeled Mail. The Email Accounts screen opens. Enter the e-mail address in the top box. Enter your desired password in the next two boxes. You can also click the Password Generator button to create a secure password, but the generated password will be quite difficult to remember. Enter your desired mailbox quota or click Unlimited. Your e-mail address is now created and ready for use. Picking the name to use for your e-mail address can be tricky. Do you want it personalized to you or do you want it more general? Do you want to repeat a word from your domain name or do you think that would look a little odd? Memorable. Your name is memorable. CEO@ is memorable; peterthedude2487@ is not memorable. Short. You don’t want to make your e-mail address so long it doesn’t easily fit on a business card or is a mouthful to say. Simple. Avoid tricky spellings, or people may get it wrong when trying to e-mail you and the mail will not arrive. Sometimes the solution to choosing the right name is to have more than one name. Even if there is just one of you behind the website, additional mailboxes can add legitimacy, professionalism, and a way of keeping different types of mail separate. For instance you may want a personal e-mail address of Bob@tinycarparts.com to give to suppliers and your best customers but not want the whole world writing to you there. In that instance, it might be worth creating a second e-mail address of Service@tinycarparts.com or contact@tinycarparts.com. You can then choose whether to have them as completely separate e-mail accounts or whether to forward one to the other. 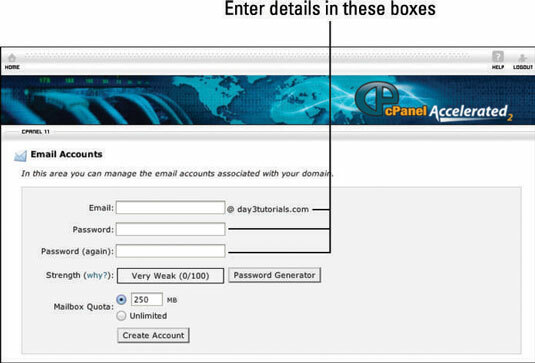 Selecting the correct mailbox size depends very much on your hosting plan. Many web hosts count the size of your mailboxes as part of your web space allowance, which can severely limit what size the mailboxes can be. Every e-mail that comes in or that you send out has a physical size. That size is made up of how much data is in the e-mail — including how long it is and whether or not it has any attachments. An average size for an e-mail that is just text is less than 10K. That means a mailbox that is 100MB in size could hold around 10,000 e-mails. However, if people are sending you images, each image can easily be 2MB so a 100MB mailbox could only hold 50 e-mails with 2MB images in them. A mailbox size of around 250MB gives you plenty of room for mail, including mail with attachments. If you regularly delete unnecessary mail and attachments, a mailbox of that size can keep you going for years. If having plenty of space for mail is important, select Unlimited or put in a really high number. You can only use up to whatever your plan limit is, but at least you won’t hit an arbitrary limit on the way.